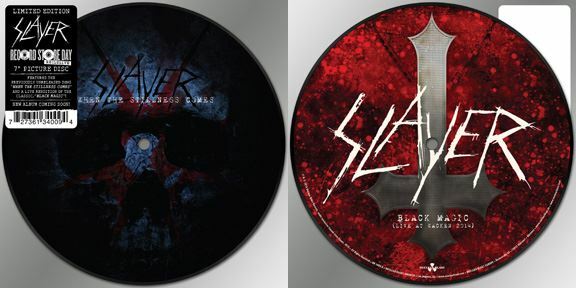 "When The Stillness Comes", the first new track from SLAYER in nearly a year, will be available as part of Record Store Day on April 18, it is announced today by SLAYER and Nuclear Blast. The song, accompanied by a live recording of "Black Magic", from the band's 1983 album "Show No Mercy" and recorded live at the 2014 Wacken Open Air festival, will be available as a limited-edition (only 5000 copies worldwide), seven-inch vinyl picture disc exclusively at all participating independent record stories worldwide. Log on to www.recordstoreday.com for the list of stores. SLAYER is currently putting the finishing touches on its new CD with producer Terry Date, who previously worked with the band on "Implode", a song that was made available as a free download following SLAYER's surprise performance at last April's Revolver Golden Gods awards in Los Angeles. 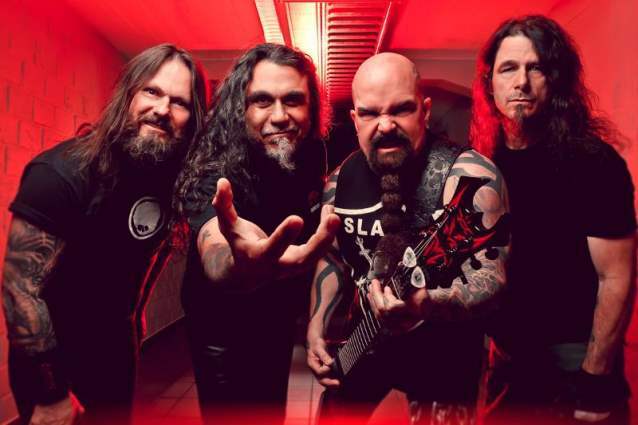 Joining guitarist Kerry King and bassist/vocalist Tom Araya during the sessions for SLAYER's new album are returning drummer Paul Bostaph, who replaced Dave Lombardo in 2013, and guitarist Gary Holt (also of EXODUS), who has been filling in for Jeff Hanneman on tour for the past five years. SLAYER's next CD will be released on Nuclear Blast through the band's own label imprint, closing out a 28-year relationship with Rick Rubin and American Recordings. It will also be SLAYER's first album without the group's co-founding guitarist Jeff Hanneman, who passed away in May 2013 from alcohol-related cirrhosis of the liver. He is credited for writing many of SLAYER's classic songs, including "Angel Of Death" and "South Of Heaven".